NASA’s preparations to test a saucer-shaped spacecraft have placed the iconic ‘flying saucer‘ back into the popular consciousness. 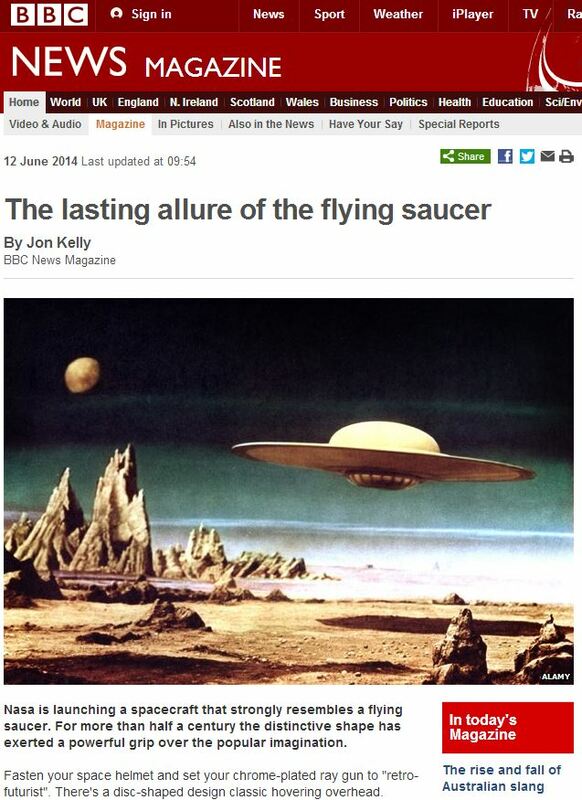 In a BBC Magazine feature journalist Jon Kelly explores how the saucer ‘has served as visual shorthand for the gleaming, jet-propelled, post-war vision of the future’. Saucers are of course familiar to everyone from ’50s sci-fi classics such as The Day the Earth Stood Still but also turn up in architecture, such as the prefabricated Futuro houses designed by Matti Suuronen. The saucer-shape appears in toys, kettles, phones, sherbet-filled sweets and even a number of English pubs. One such hostelry, in Gillingham, Kent, was re-named following a ‘flap’ of UFO sightings nearby in 1954. 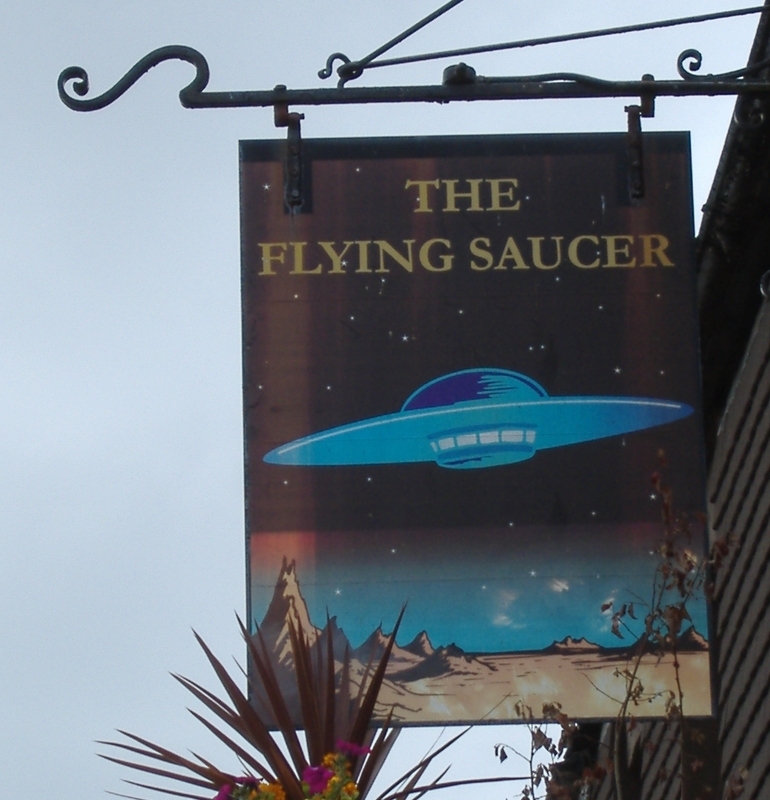 I enjoyed a pint of best bitter inside this Flying Saucer during a trip to interview Derek Dempster, the former Spitfire pilot and UFO watcher, a decade ago. NASA’s plans return us full circle to the optimistic post-war era sandwiched between the UFO flaps of 1947 and 1967. And some forward-thinking engineers such as Britain’s John Frost tried to turn these ideas into reality. But Frost’s design for a futuristic prototype flying saucer for Avro-Canada (‘Project Y2′) – based on German designs from WW2 – never made it past the drawing board. And despite many subsequent attempts to revive the idea – such as the British Railways Board patent for a fusion-power saucer in the ’70s – saucers have remained firmly in the eye of the beholder. This entry was posted in Uncategorized and tagged BBC, BBC Magazine, British Railways Board, Derek Dempster, flying saucer pub, flying saucers, Futuro house, Gillingham, John Frost, Jon Kelly, Matti Suuronen, NASA, Project Y, The Day the Earth Stood Still. Bookmark the permalink. I saw a Flying Saucer UFO over Bradford, West Yorkshire, at approx. 10.30pm on Sat. July 30th 2011. I know what I saw. It was real, and it wasn’t man-made. No military on earth can possibly have craft with such capability as I witnessed. I don’t even care whether anyone believes me or not, I now know the truth, that these things do exist and they are visiting us.